The Vic Market end of Elizabeth Street has always been notorious for having not much on at night, and is a popular spot for hobos to gather. Then, upsprung a whole bunch of Asian restaurants. One decided to open till 11pm on weeknights and 2am on Fri/Sat nights. So popular was it that it opened another restaurant two doors down from the first one. Malaysian food is enjoying its hey day with the massive popularity of Laksa King in Flemington and late night opening Chilli Padi at Melbourne Central. Add Coconut House as a killer contender. These guys are famous for their chicken and rice dishes, but just about everything I’ve had here has been top notch. They do a mean laksa that almost contests with Laksa King, with mixed vermicelli and egg noodles, chargrilled eggplant, and delicious not-too-heavy spicy coconut broth. 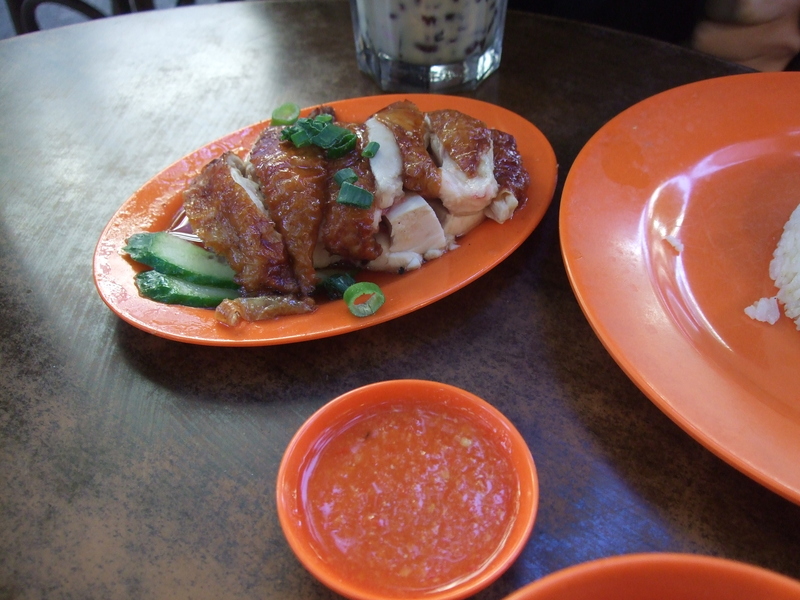 Their hainanese chicken is yummy but the dish fails on account of gross broth and lame chilli sauce. If only they served it with their spicy sambal! The roast chicken is beautifully juicy and tender and their signature nasi lemak comes with this killer sambal sauce. All the dishes are under 10 bucks and all the servings are just right for a hungry eater. You cannot have a meal without having their speciality drinks, in particular the 3 colour teh. Coconut House is a typical Asian cheap eatery, no frills and no service. Help yourself to a table, fight for a menu, go to the counter to order, get your own damn water, eat, enjoy and get the hell outta there. Tags: Budget Eats, chicken, Elizabeth Street, Laksa, Malaysian, Melbourne. Bookmark the permalink.